By now, most of you know Molly Stevens is one our most revered chefs. So when we went looking for a potato gratin for the Christmas Eve meal, her name popped up in the search and we knew we had a winner. This gratin tastes more complex than simple cheese and potatoes—it’s comfort food yet sophisticated at the same time. 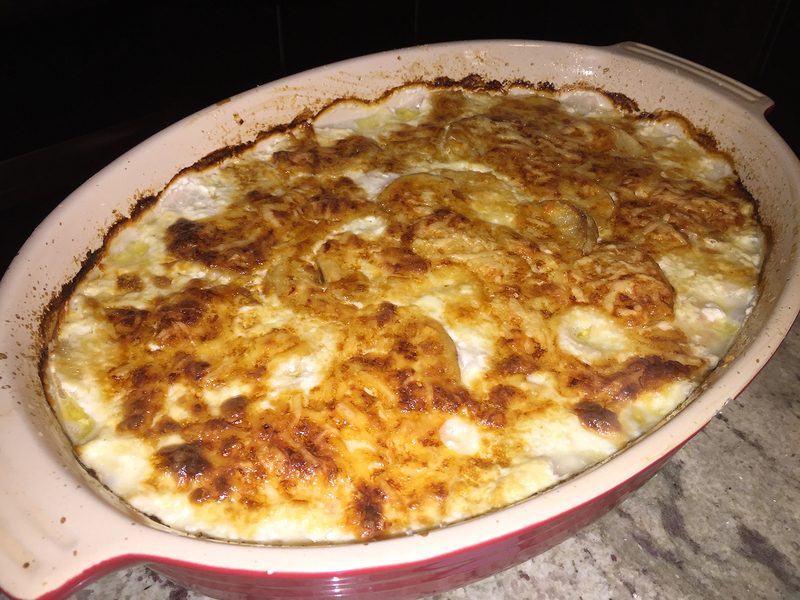 By no means diet-friendly, the Three-Cheese Potato Gratin is a calorie-buster with all of the whole milk, heavy cream, cheeses and butter (we even increase the amount of the cheeses.) But good God, it’s heavenly!! So if you are counting calories, (which at some point in our lives most of us are) just eat a small portion. To create, it was a group effort with Russ, his son Dan and me all pitching in to assemble the casserole. 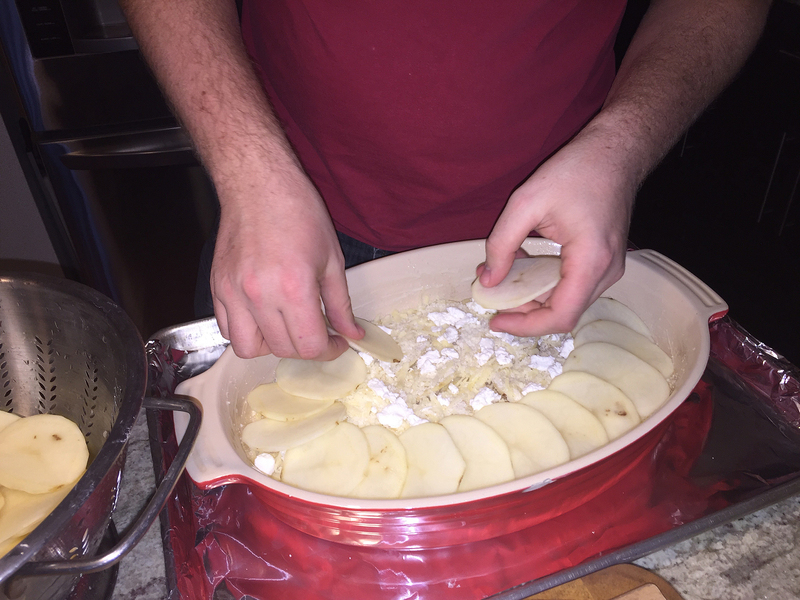 Dan did a great job slicing the potatoes on the mandoline and grating the cheeses, while Russ prepared the milk and cream mixture. I buttered the dish and started the layering process, taking turns with Dan until complete. 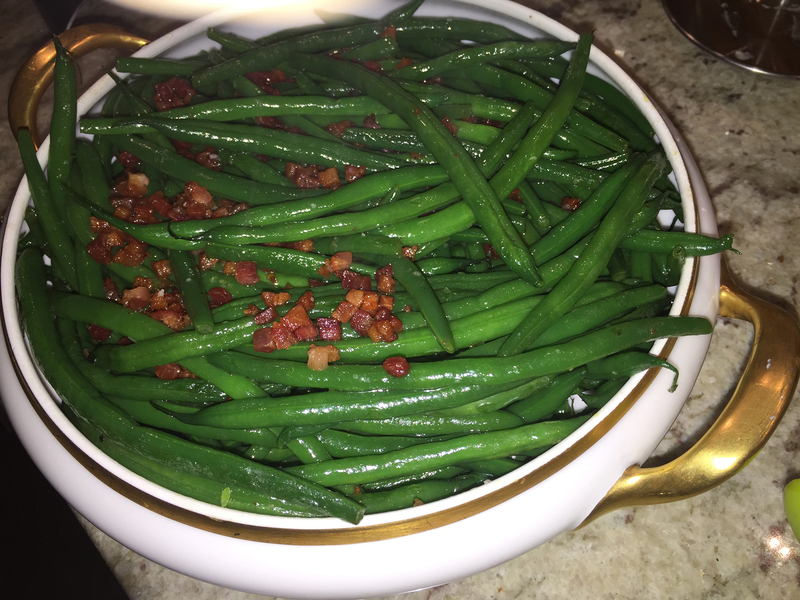 With our standing Prime Rib Roast, and Haricot Verts with Pancetta (recipe follows), the gratin was a perfect match and made for a divine Christmas Eve dinner. 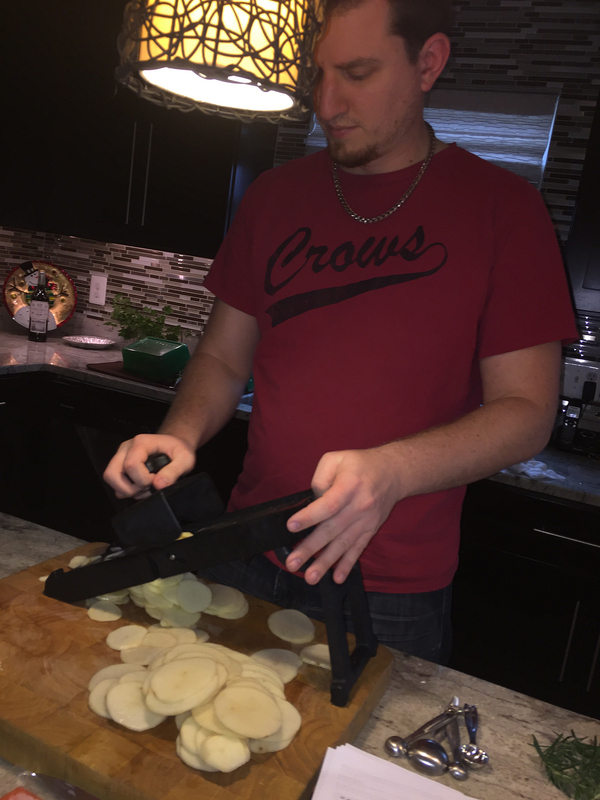 Dan uses the mandoline to make perfectly even potato slices. The slices are all equally 1/8″ thick. 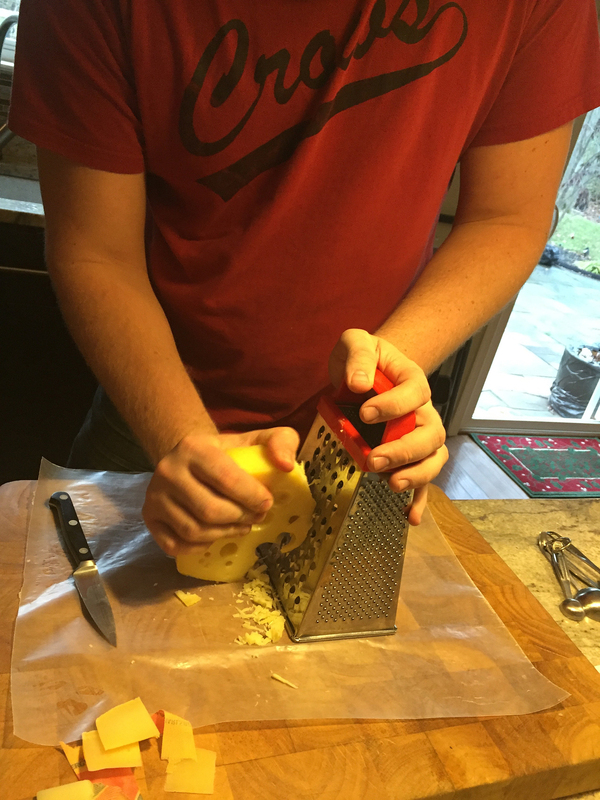 Dan puts some muscle into shredding the Swiss cheese. 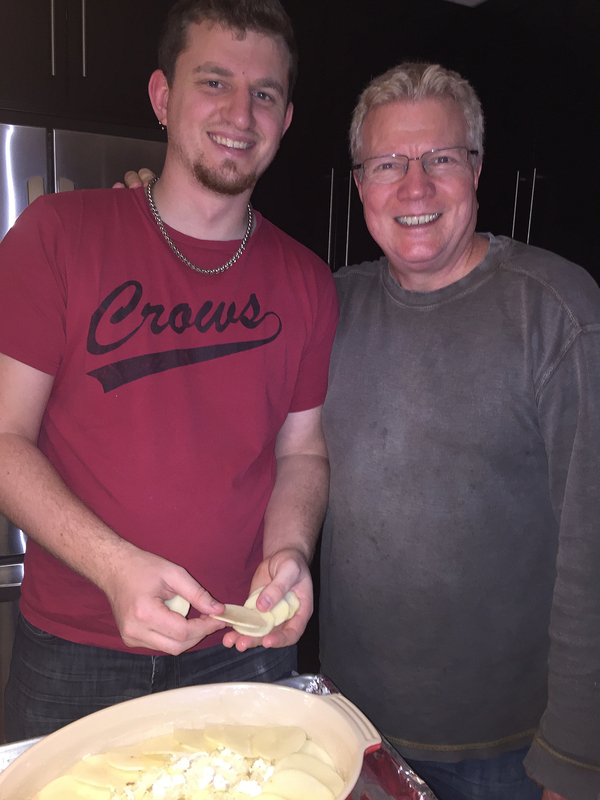 Father and son bond over the cooking experience. 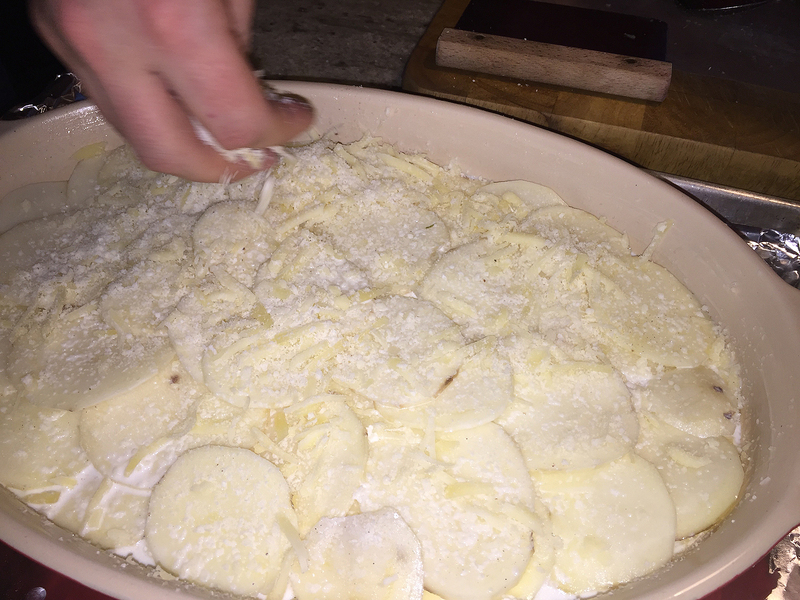 Lynn adds the shredded cheese mixture to the first layer of potatoes. 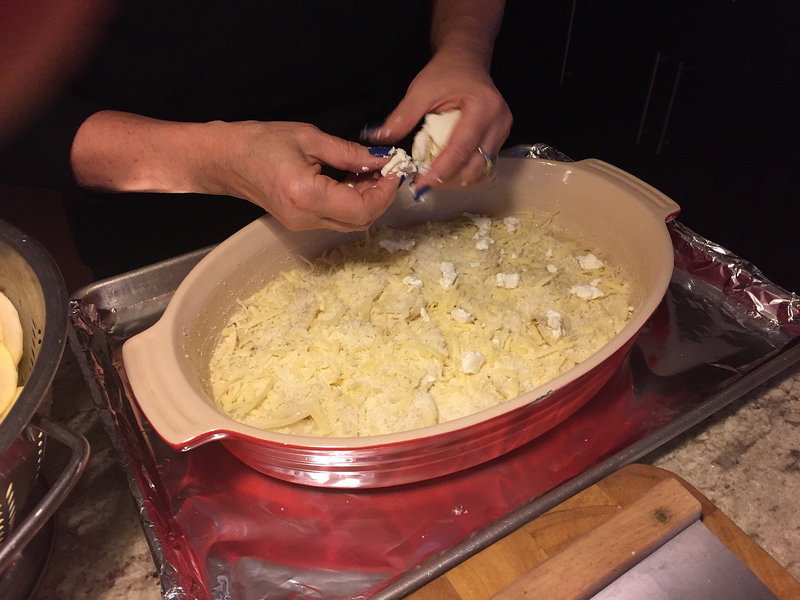 Next, Lynn crumbles goat cheese over the shredded cheese layer. Dan takes over to add the second layer. 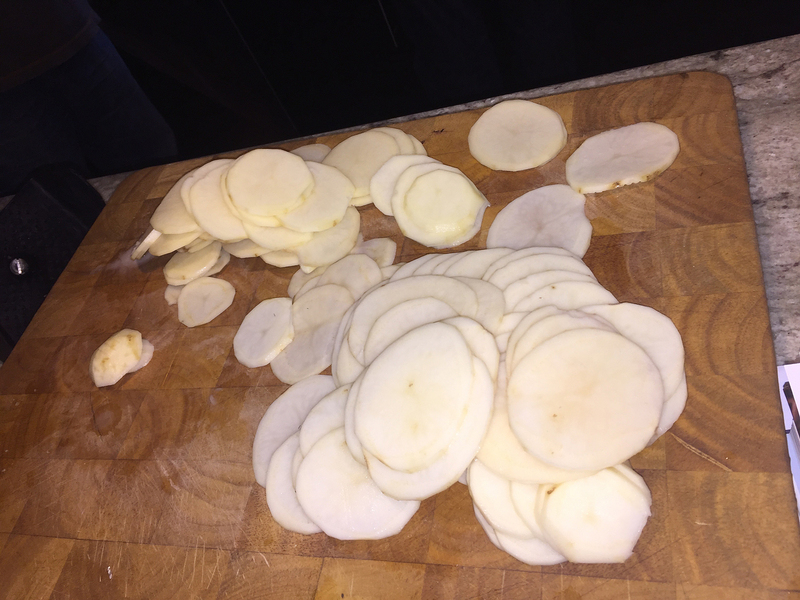 The final potato slice is added. Russ pours the infused cream mixture over all layers. On top of the cream, a final topping of the shredded cheeses. Luscious goodness after resting for twenty minutes, yum! Position a rack in the center of the oven and heat the oven to 350°F. Line a rimmed baking sheet with foil. 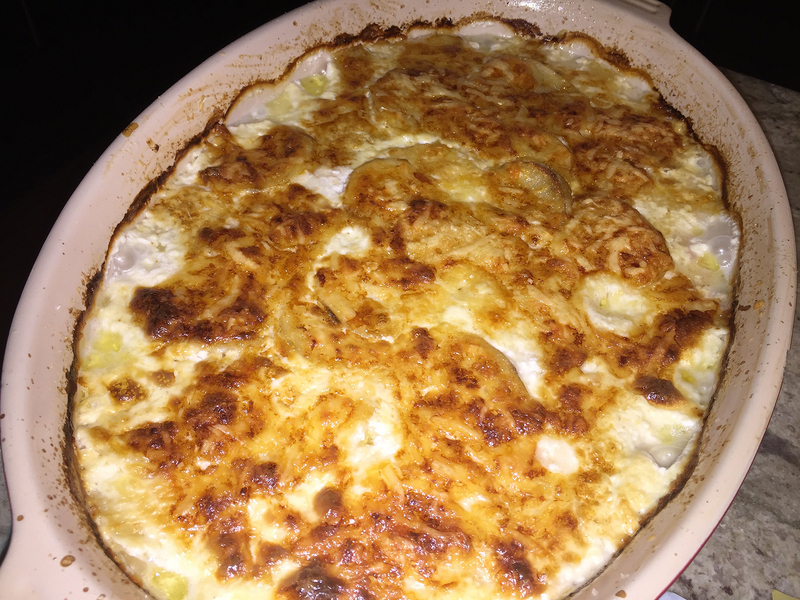 Grease a 9×13-inch baking dish with the butter. Pour the milk and cream into a small saucepan. Add the garlic, rosemary, and nutmeg. Bring just to a simmer, cover, and remove from the heat. Set aside to infuse for at least 20 minutes. 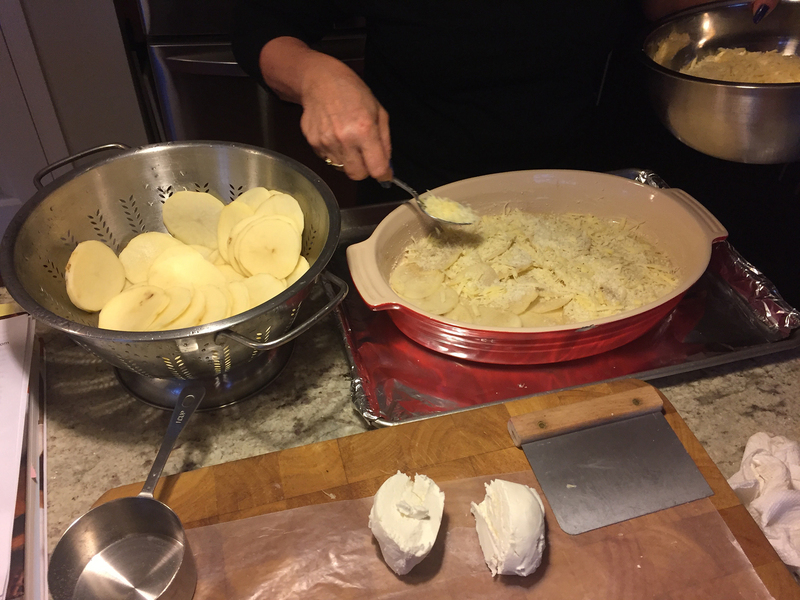 Combine the Swiss cheese and Parmigiano in a bowl. Remove the garlic and rosemary from the infused cream, and discard them. Set the cream over medium-high heat and watch carefully until it just begins to simmer; don’t let it boil. 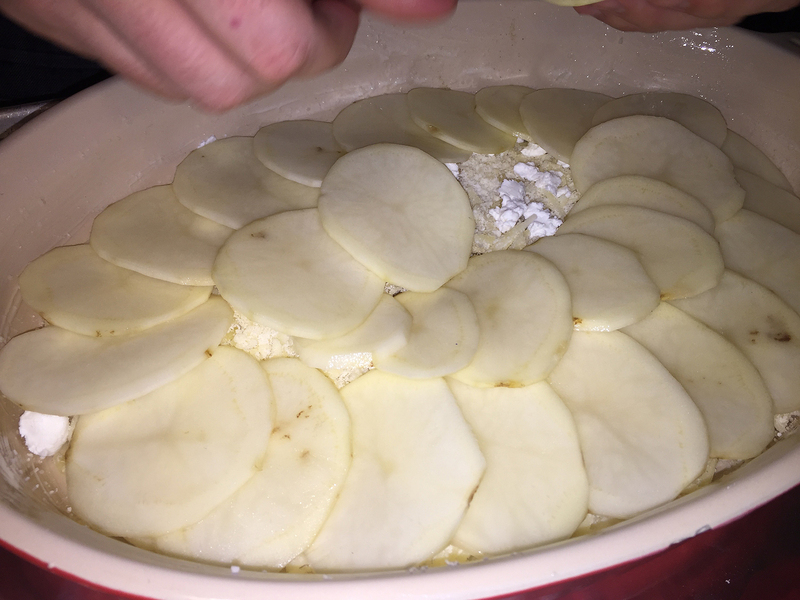 Pour the cream over the potatoes and sprinkle the remaining cheese on top. 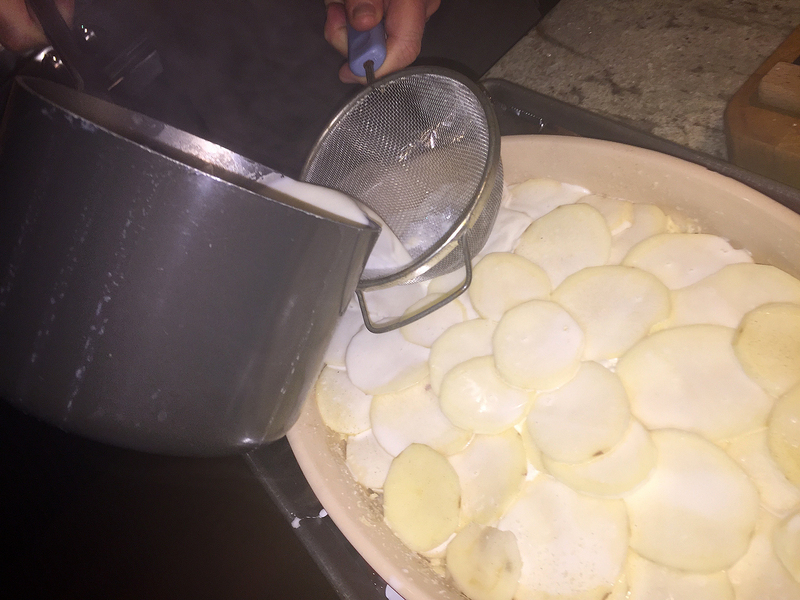 Set the baking dish on the foil-lined baking sheet, and bake until the top is deeply brown and the potatoes are completely tender when poked with a skewer, 1-1/4 to 1-1/2 hours. Let sit for 10 to 15 minutes before serving. Heat large skillet over medium heat. Add pancetta and sauté until crisp, about 3 minutes. Using slotted spoon, transfer to paper-towel-lined plate to drain. Increase heat to medium-high. Add butter to same skillet. Add beans and stir until heated through, about 4 minutes. Season with salt and pepper. Stir in pancetta.